Only 'hardware' what about our 'software'? My colleagues and I were at Changi Village Hotel on Friday for a workshop. We were divided into different groups and mine consist of 4 Singaporeans and 1 Indian National. The whole session was rather fun and when we came to the final activity which was kite making, we were lost. Fortunately for me, we had an Indian National in the group who was able to make one easily. So were the rest of the group who had at least a foreigner. However, the group that was made up of all Singaporeans took a while to complete. In our own groups, we went out to the field next to the jetty to fly the kite. Was it a surprise that the kite that was made by the sole Singaporean group, was not able to fly? A Singaporean commented that no wonder we need Foreign Talent. Another one said it's true that we don't know everything. A third one then said that perhaps Singaporeans born in the 50s or 60s will know how to make a 'layang'. My reaction was, what happened to our upbringing? Were we robbed of our childhood? The facilitator of the program agreed with me. According to her, among all the company communication workshop that she had conducted, only Singaporeans had a problem. The rest of the Nationality was able to make one easily citing that they all have childhood experiences in making one. As a Singaporean reading this, you may think that why would I need to know how to make a kite? No big deal what, Lilian! But as a Singaporean who was there that day and now writing this blog post, I felt very strongly about it. Disappointed that we advance from a 3rd to 1st world country merely by having more 'hardware'. That is, one can see more landscapes, skyscraper, skygarden, world's best airport, highest outdoor pool, tallest hotel in Asia, casino, NEL, Circle Line, Downtown Line, etc. Something is missing. What happen to our 'software'? We need a courtesy month to remind us to be courteous. Reminder notices and advertisements on giving up seats to people who needs it more, are seen on public transport. Phua Chu Kang to remind us to be gracious. We reserved parking lots with bins and seats with tissue packs. 'No urinating' signs are seen in lifts. Big yellow boxes are drawn to show commuters where they should stand while waiting for the trains to arrive. That is, by the side so as to let people alight first. Maybe sometimes queue poles to know how to queue. An advertisement to remind us to be filial. 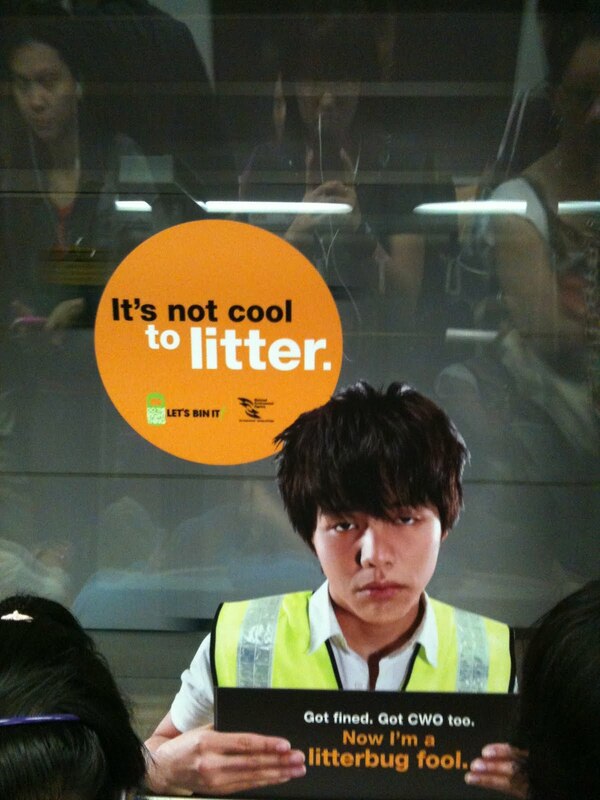 And lately, another new advertisement to please remember to educate your children not to litter. The ad uses a graduate who went through proper education but was found littering hence Corrective Work Order awaits him. What have we become? If we are not like that, why these reminders and advertisements? When foreigners see these ads, they perhaps may think that Singaporeans are a bunch of rude, unfilial, disorganized and ungracious people. As we advance, don't forget our 'software'. As per previous years, I volunteered my time to be a bus leader for a 1 day temple trip organized by HGCC (Hougang Constituency Committee). The trip which took place yesterday was not new to me and as usual apart from the 1st year, I was assigned a new member to be my partner :) Should I be saying, thank you for the trust in me to be able to lead the new member? Haha! My partner this year was Pritam who just joined WP. Very new member but not new to politics I must say. Despite knowing that he would have difficulty communicating with the bus full of residents, Pritam volunteered his time. Very commendable indeed. This year, we were assigned to a rather outspoken bus driver from bus 7. Due to his personality, we shared a fair bit during the journey. At 8am before we set off for the 1st location, I went up to him to ensure that he has no problem getting to the places that was in the itinerary. Hmmm I guess he was referring to the recent experiences that commuters had with SPR bus drivers. I nodded my head and told him that if he meant bus leaders, yes, we volunteer as long as our schedule permits. I carry on to explain that if he is referring to the 1 day trip, yes, as far as I can remember, it's an annual event. Ah Wang's reply made me smile and I cannot help but agree with him. Ah Wang was sort of shouting at the top of his voice while driving so that the residents can hear him. He was full of praise for these residents! He praised them for not succumbing to the upgrading temptation that was offered in the last election and many more. I do not know how many of them heard him. All I can remember was my conversation with Ah Wang. He was telling me how tough life can be if he loses his job. He is constantly afraid that his job would be replaced by foreigners. I can feel his fear, really.